Often asked if Buddhists, any Buddhist, believe in a Supreme Being analogous to the Western God. My answer is always, “No, we don’t. If any sect proclaims an original anything then they are not Buddhist.” Clearly, belief in a first cause is an anti-Buddhist idea, according to the words of the Buddha himself. The question then arises, “Who do Buddhists pray to?” Having been originally trained as Theravada Buddhist monk the word and idea of “prayer” was not altogether alien to me, but I hadn’t formally prayed since I was 11 years old. I don’t remember praying after that. I had some hopes and aspirations and would say things like “I hope” such and such happens or doesn’t happen; but I am not sure if that qualifies as “prayer” in the Western sense. I was just throwing it out there to the universe — but was this a prayer, an aspiration or just a hope? Because we in the West are mainly new converts to Buddhism we avoid the term “prayer: as much as possible. It’ s a word too much tied into our Biblical heritage and much that we see is wrong with the Western culture in the first place. Even in the Japanese Jodo temples I have visited the term “prayer” is often not heard, instead the priest might use the word “meditation” or “contemplation” when they call on the Buddhas for blessings, what is called a “benediction” in churchy circles. The word “prayer” comes from the Latin word prec, as in precarious. It literally means to “gain something by entreaty”, but since the 13th century CE is has been used to in the sense of praying to a heavenly being other than a god. We hear it in Shakespeare all the time where it is used in place of the word “beg”. I am not sure I have ever heard a Buddhist beg during a ritual or ask for gain. The Buddhas and other spiritual beings do not have the power to grant favors. Yet, there is a use for the word “prayer” in the glossary of Western Pure Land Buddhism, also called Amidism as well as other Buddhist traditions. Most Buddhists in the Mahayana movement practice with prayer. Prayer is, after all, a devotional aspect of all faiths. They “offer” prayers to Buddhas, Bodhisattvas, and other spiritual beings. We need to careful, however, In the West we have the Buddha is vaguely equated with God or Jesus, and meditation is often viewed suspiciously as a form of self-hypnosis or a kind of mysticism or an escape from reality. This is not entirely the result of Western ignorance and ethnocentrism. Before his parinibbana the Buddha predicted that within a thousand years his Dhamma would become corrupted and distorted, as it would fall into the hands of men of lesser understanding. We can see this seems to have happened in much of Asia where ritual replaced self-discipline; a sort of “believe only” faith replaced insight, and prayer replaced understanding. If done with the correct motivation prayer can be a very important part of the religious life of Buddhists who follow the Dhamma but recognize that they are not now, nor are likely to become, Buddhas in this lifetime. We are still intimately entwined Samsara, our everyday life; but have a genuine connection to the Buddha. This relationship with the Buddha is often expressed through prayer. We are not yet enlightened. We still suffer without understanding. We still insist in believing that “karma” is something that just happens to us because of forces and actions that took place long ago. We continue to see ourselves as victims of life without responsibility for our lives. Because we are far short of the goal, some reach out to the Buddha, Gotama or some Celestial one, in hopes of finding relief from our pain. This is how we express our relationship to him. We want to live the Noble Life but are unable because of our kamma. If we feel we cannot help ourselves we look for help elsewhere. We are on the Way but not yet reached our goal. We hear the Buddhas’ invitation to live a life of indiscriminate compassion while continuing to label others as friend or foe, and events as good or bad, pleasurable or painful. 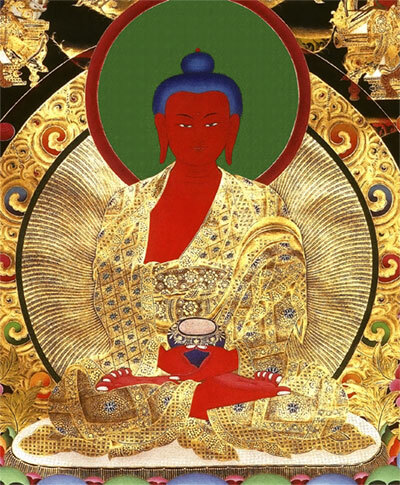 Prayer can place our relationships in Samsara within the in the context of Buddha’s universal compassion. It expresses our immediate and perpetual remembrance of the Buddha and our awareness of our own incomplete and deluded nature. Prayer is not a technique, mental training or even meditation. It is our response to suffering and hardship. Prayer is a way of establishing a connection to the inexhaustible possibilities of Awakening. It is the verbalization of our aspiration to Awaken and thereby being of benefit of all beings. Prayer is an expression of the Dhamma and a compassionate action in our personal world.